Your desire to be married at St. Elizabeth Ann Seton Parish affirms that you see your marriage as a commitment made before God, with the desire to grow in love of God and one another. These parish guidelines are meant to assist you in the planning of your upcoming marriage and offer some details regarding the wedding ceremony. Please contact the parish at least six to nine months prior to the date of the marriage. No date can be reserved without parish approval. Parish membership (or the permission of your pastor to have your wedding at St. Elizabeth) is necessary. Also, in addition to three face-to-face sessions with the pastoral minister, the completion of a Natural Family Planning course and attendance at a pre-marriage conference are required. If the parish calendar has no conflicts, your wedding may be scheduled for any day of the week (excluding Sunday). When reserving the wedding date, a stipend of $75.00 (which will be used for Works of Charity) is due. 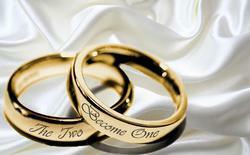 Saturday weddings can begin as early as desired, but no later than 2:00 pm. They must be completed by 3:30 pm because of our Saturday evening confession and Mass schedule. A certified copy of your baptismal record dated within six months of your wedding is required.